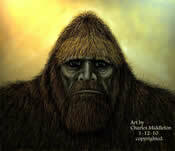 BIG FOOT, SASQUATCH, YETI, SKUNK APE, CONGO APE... These are real creatures encountered by countless individuals around the world since time immemorial. World famed ape expert, Dr. Jane Goodall, ape anatomy expert, Dr. Jeff Meldrum, and noted researchers around the globe believe in the existence of these unique creatures. I led several expeditions into the deep wilderness of Oregon, and had personal encounters with these gentle giants, which are documented on this website. It is imperative that the truth concerning Big foot be presented so you can join our mission to protect these incredible creatures. The habitat they need is being cut down, and sent to China on great ships. Consortiums with corrupt and greedy concerns are systematically clear cutting the ancient old growth forests, destroying the eco systems which die along with the trees. Fellow citizens, join us in seeking an end to this terrible travesty. In May of 2009, the latest expedition was completed. Please click on the "Photo Gallery" above, and then "subscribe" to see the most recent photographs. Another expedition is set for May, 2011. We are headed back to Oregon to seek additional contact with BigFoot and look for more evidence! Follow our adventure on the blog page. We will be posting pictures too the Photo Gallery. Copyright © 2009, Bigfoot ABC's, All rights reserved.